“Fugue: Bach and His Forerunners.” Johann Sebastian BACH: The Art of Fugue, BWV 1080: Contrapuncti 1, 2, 3, 4, 5, 8, 9, 11 (1740-45, 1748-50). Louis COUPERIN: Prelude in D minor (c. 1650). Girolamo FRESCOBALDI: Capriccio la, sol, fa, me, re, do; Capriccio sopra un soggetto (pub. 1624). Giovanni GABRIELI: Fuga del nono Tono. Johann Jakob FROBERGER: Ricercar 5 (1656) (rec. 2008). Colin Tilney (anon. 18th-cent. Italian hpsi). Music & Arts CD-1226 (http://www.musicandarts.com/). Distributed in the US by Albany Music (http://www.albanymusic.net/). 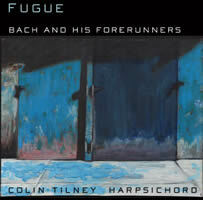 Tilney’s measured pace charms, ditto the vivid sonorities. The Italian works are relevant. After Bach Contrapuncti, the Froberger hits hard. 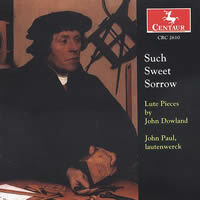 “Such Sweet Sorrow.” Lute Pieces by John DOWLAND (33) (rec. 2002). John Paul, Shawn Leopard (in duos) (Anden Houben lautenwerck). Centaur CRC 2610 (http://www.centaurrecords.com/). Distributed in the US by Qualiton (http://www.qualiton.com/). “A lute controlled by a keyboard” (Houben). Paul’s secure fingerwork and color choices put this with North, O’Dette, Lindberg. Superb sound. 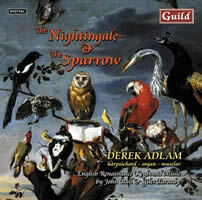 “The Nightingale & the Sparrow.” English Renaissance Keyboard Music by John BULL (9) & Giles FARNABY (5) (rec. 2001). Derek Adlam (hpsi after Ioannes Ruckers, 1638; muselar [virginal] after Ioannes Ruckers, 1611; org “after an English instrument of c. 1540”). Guild GMCD 7233 (http://www.guildmusic.com/). Distributed in the US by Albany Music (http://www.albanymusic.net/). Adlam is better known as an instrument-maker (two fine examples here), but he can play. In Nomine IX (Bull) develops and rolls irresistibly. 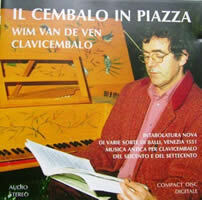 “Il Cembalo in Piazza.” Anon. : Intabolatura Nova di varie sorte di balli (Venezia 1551). Jacques DUPHLY: Primo Libro: Minuetti e Rondo (1744). Antoine FORQUERAY: Prima Suite: La Cottin (pub. 1747). Dietrich BUXTEHUDE: Suite in C major (Allemanda, Corrente, Sarabanda, Sarabanda, Giga). Benedetto LEGATI: Presto spiritoso. Wim van de Ven (hpsi after Pascal Taskin). (self-issued) MRK 931602 CD. Amazon has copies. Praise for van de Ven the builder, but execution is awfully stiff. The Venice dances were the first printed in Italy. Bux achieves lift-off. 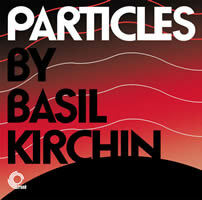 Basil KIRCHIN: Particles (2003-05). Comp. & orch. Kirchin “with contributions from Iain Firth and Clive Leslie.” Alan Barnes (bs clar, alt sax), Bruce Adams (trpt), Chris Karan (drums), Kirchin (others). Trunk JBH021CD (http://www.trunkrecords.com/). Kirchin’s final effort recasts strands of talk as music — voluble, staccato, murmuring. A trio locates the jazz, as Britspeech origins stay.